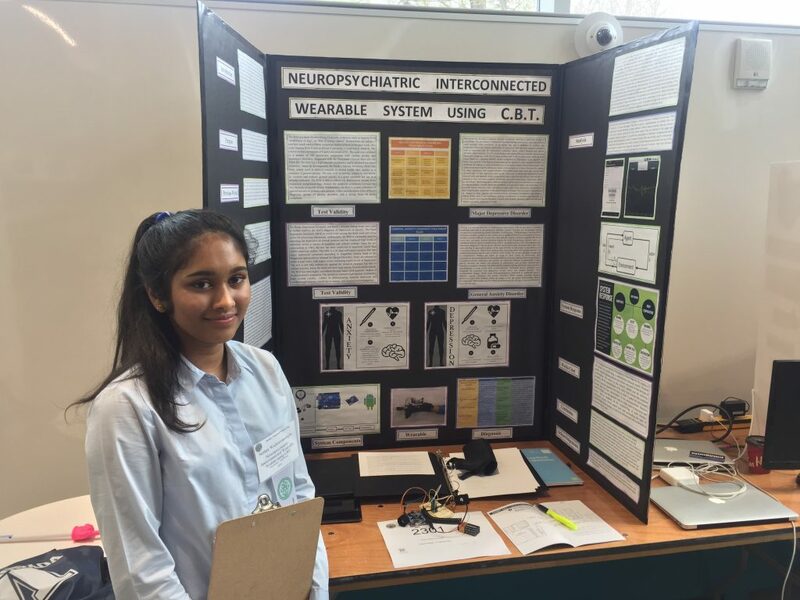 Congratulations to Nethra who will be representing Lockerby Composite and the Sudbury region at Canada-Wide Science Fair in Fredericton, New Brunswick! Nethra took home several special awards and 1st Place in the Intermediate Engineering Division at this weekend’s Sudbury Regional Science Fair. This project is a non-invasive wireless system that aims to treat neuropsychiatric disorders through the use of a biomedical sensor wearable and cognitive behavioural therapy (CBT) app. The biomedical sensor system monitors a user’s heartrate, galvanic skin tension (hormonal/ sweat gland activity) and skin temperature, in order to conduct an analysis between a user’s physical symptoms and mental health. The wearable relays the sensor data using a programmed arduino and bluetooth component to an android app where the user is updated on physical symptoms and notified of changes in physical health. The sensor data is analyzed using AI and machine learning algorithms to detect patterns and variants in a user’s physical symptoms to provide an interactive treatment process. After a period of four weeks the user is diagnosed with major depressive disorder or general anxiety disorder according to their symptoms, and are directed to the corresponding treatment. The diagnosis is further verified using accredited diagnostic indexes to increase accuracy. Both treatment plans for depressive and anxiety disorders focus on reinforcing the strands of cognitive behavioural therapy. CBT allows the user to identify and replace maladaptive thoughts and behaviours and training user’s to improve their mental health in the long term.